Producer Scott Fujita, Steve Gleason with his wife Michel Varisco, and Director Clay Tweel at the Los Angeles premiere of the film, “GLEASON." The ALS Association Golden West Chapter is proud to recognize the filmmakers of the newly-released documentary, “GLEASON,” for their outstanding achievements in the fight against ALS at the 3rd annual ONE STARRY NIGHT: A Special Performance Dedicated to Conquering ALS on Monday, August 15, 2016 at the Pasadena Playhouse. The public is invited to join Honorary Co-Chairs pop superstar Miley Cyrus and Pilates guru Mari Winsor for this one-night-only benefit in support of the ALS community featuring an rich gathering of talent from stage and screen. Director Clay Tweel will accept the Golden West Chapter’s 2016 Spotlight Award, which is presented to those who help to raise ALS awareness by educating the public about the experience of living with ALS and the impact the disease has on loved ones and caregivers, on behalf of the entire production team. The hit documentary from the 2016 Sundance Film Festival goes inside the life of former NFL star Steve Gleason, the former New Orleans Saints defensive back who, in 2011 at the age of 34, was diagnosed with ALS and given a life expectancy of two to five years. Weeks later, Gleason found out his wife, Michel, was expecting their first child. A video journal that began as a gift for his unborn son expands to chronicle Steve’s determination to live as fully as possible. The film highlights his mission that people with ALS can not only live but thrive after this diagnosis, along with many of the extraordinary successes achieved by the Gleason Initiative Foundation (“Team Gleason”), including the creation of the “Team Gleason House for Innovative Living” and the passage of “The Steve Gleason Act” which assures the availability of life sustaining communication devices for people with ALS and other diseases. 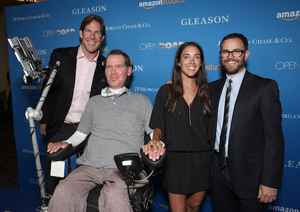 Distributed by Amazon Studios and Open Road Films, “GLEASON” has received glowing reviews both from audiences and news outlets including the Los Angeles Times, New York Times, Rolling Stone and Variety, to name a few.